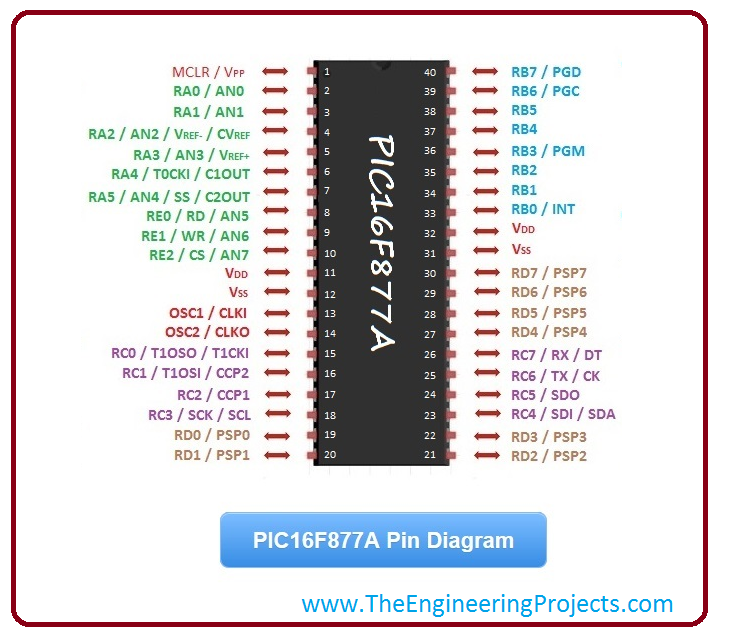 A complete step by step tutorial in which basics of PIC16F877a Microcontroller is discussed. Hello friends, I hope you all are doing great and having fun with your lives. Today, I am going to give you guys an Introduction to PIC16F877a. It’s a most commonly used PIC Microcontroller because of its operational flexibility, availability and cheapness. You can buy this PIC Microcontroller from almost every online electronic shop and you will get it just for $2 – $3. You can download PIC16F877a Datasheet by Clicking Here. It has five Ports on it starting from Port A to Port E.
It has three Timers in it, two of which are 8 bit Timers while 1 is 16 Bit. It supports both hardware pin interrupts and timer interrupts. Here’s the PIC16F877a Pin Diagram, I have mentioned the names of all the Pins and have also given different colors to different Ports. The above image gives you the overall idea of PIC16F877a Pins and Ports. You should also have a look at Introduction to Atmega328, it’s another microcontroller, you should compare them. You can see in the above image that pins of PIC Microcontroller has more than one name, its because each pin of PIC can perform many tasks. For example, check Pin # 25, it can be used as a digital Port C Pin # 6 (RC6) and can also be used as a Transmitter (TX) for serial communication. So, now its up to you how you wanna use each pin, and we will check most of these pin functions in today’s tutorial. In the next section, I am gonna explain all of these Pin features one by one. Each PIC Microcontroller has a basic circuit and if you won’t design the basic circuit then it won’t work. It’s just like providing power to your PIC Microcontroller and it works on +5V level. If you want to turn ON fan then what will you do? You will simply provide it power and that’s what we are gonna do with PIC but in PIC case we also need to provide the frequency at which it will work. So, now we know that we need to design the basic circuit and this basic circuit contains power as well as the frequency at which it will work. In order to provide frequency to PIC Microcontroller, we use crystal oscillator and for PIC 16F877a, you can use crystal oscillator of frequency range from 4MHz to 40MHz. I have tried my best to make this PIC16F877a basic circuit as simple as possible. Pin # 1: This Pin is called MCLR (Master Clear) and we need to provide 5V to this pin through a 10k-ohm resistance. Pin # 11 & Pin # 32: These Pins are labelled as Vdd so we also need to provide it +5V and you can see these lines are in red color in above figure. Pin # 12 & Pin # 31: These Pins are Vss, so we have provided GND (Ground) at this pin and its lines are in black color. Pin # 13 & 14: These Pins are named as OSC1 (Oscillator 1) and OSC2 (Oscillator 2), now we have to attach our Crystal Oscillator (16MHz) at these pins which I have lined in Orange color. After the Crystal Oscillator, we have 33pF capacitors and then they are grounded. We have designed our basic circuit and now our PIC Microcontroller is ready to work but you can also see an LED attached at Pin # 21 and that’s because we also need to check whether its running or not so we can turn on or off this LED. 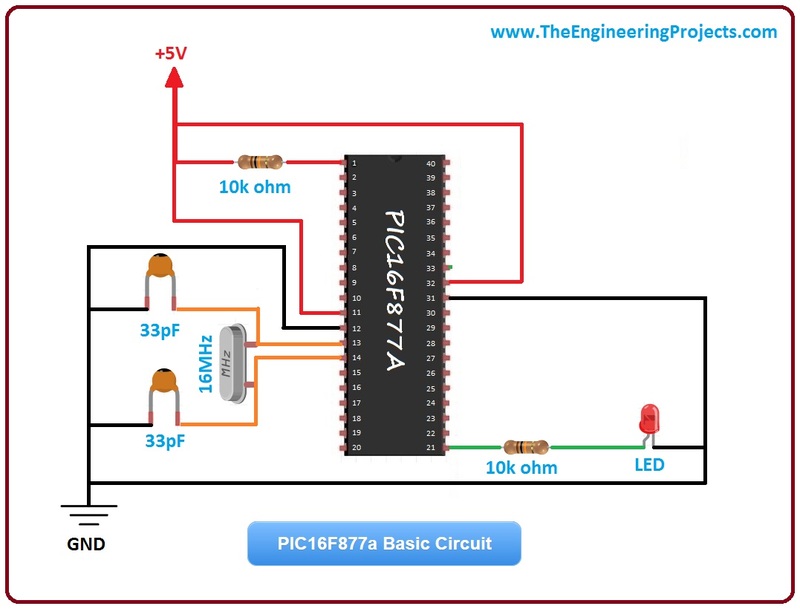 You should have a look at LED Blinking Project on PIC Microcontroller, in which I have blinked the LED using PIC Microcontroller. 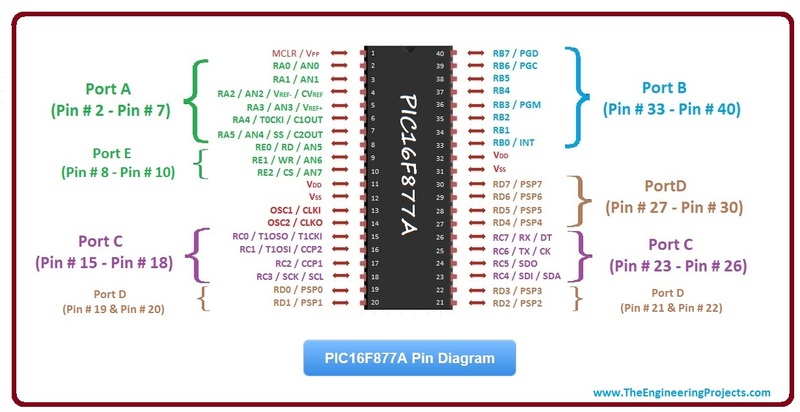 So, now I hope that you got the complete understanding of PIC16F877a Basic Circuit, so now if you have noticed that in basic circuit we have used all the power pins of PIC Microcontroller, while all the Ports Pins were free. So, now as we have powered up our PIC Microcontroller, next thing we need to do is to design some code and use the PIC Microcontroller Ports. First let’s have a look at these PIC16F877a Ports. Port A: It has 6 Pins in total starting from Pin # 2 to Pin # 7. Port A Pins are labelled from RA0 to RA5 where RA0 is the label of first Pin of Port A. Port B: It has 8 Pins in total starting from Pin # 33 to Pin # 40. Port B Pins are labelled from RB0 to RB7 where RB0 is the label of first Pin of Port B. Port C: It has 8 Pins in total. It’s pins are not aligned together. First four Pins of Port C are located at Pin # 15 – Pin # 18, while the last four are located at Pin # 23 – Pin # 26. Port D: It has 8 Pins in total. It’s pins are also not aligned together. First four Pins of Port D are located at Pin # 19 – Pin # 22, while the last four are located at Pin # 27 – Pin # 30. Port E: It has 3 Pins in total starting from Pin # 8 to Pin # 10. 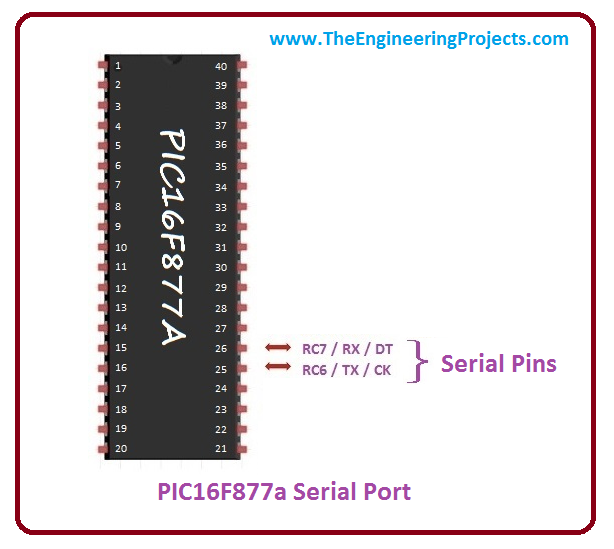 Port E Pins are labelled from RE0 to RE2 where RE0 is the label of first Pin of Port E.
You can see all these PIC16F877a Ports in above figure, now let’s have a look at how to use them. First of all what you need to decide is whether you want your Port Pins to be Input or Output. Confused? 😛 Let’s suppose you have some sensor and you want to get its value then you have to connect this sensor with PIC Microcontroller, now in this case your PIC Pin will be acting as Input Pin because it will be inputting value from sensor. Sensor is sending the value and PIC is receiving it. Now in case you have some DC Motor and you want to move that DC Motor using PIC Microcontroller. So, in this case you have to send command from PIC Microcontroller to DC Motor so your PIC Pin is acting as Output Pin. Both of these registers are of 8 bit because Port D contains 8 Pins. TRISD decides whether the Port is output or input and we can also assign values to each pin separately. If we have assigned 0 then it will be OUTPUT and if we have provided 1 then it will be INPUT. For example, if I have assigned TRISD = 0x01, then first 7 pins of Port D will be Output but the last pin will be input because 0x01 is actually 00000001 in binary. PortD register contain the actual value and this value is actually the combination of all the 8 pins. Official Compiler of PIC Microcontroller is MPLAB C18 Compiler, which is available online from Microchip Official Site. There are also other compilers available and the one I normally use is MikroC Pro For PIC. You should have a look at this list of Top 3 PIC C Compilers. We write code in PIC Compilers and then compile it. After compilation a hex file is generated which we upload in PIC Microcontroller. PIC16F877a has one serial port in it which is used for data communication. In below figure, I have mentioned the Serial Pins of PIC16F877a. Pin # 25 is acting as TX as well so if you want to do Serial Communication then it will be used for sending the serial data. Pin # 26 is acting as RX as well so if you want to do Serial Communication then it will be used for receiving the serial data. You should also have a look at What is Serial Port if you don’t know much about Serial Port. 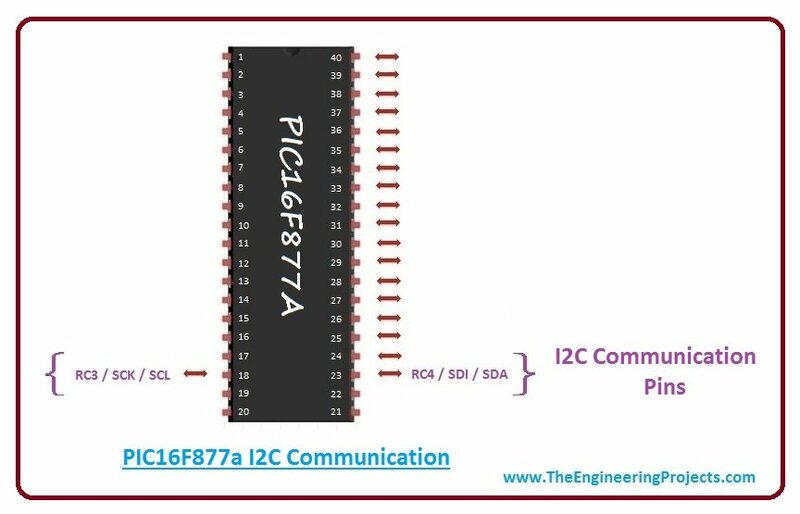 PIC16F877a also has one I2C Port using which we can easily do the I2C Communication. Pin # 18: It is acting as SCL which is an abbreviation of Serial Clock Line. Pin # 23: It is acting as SDA which is an abbreviation of Serial Data Line. Now you can see we have Serial Port and I2C Port in Port C, so we can use Port C as a simple Port but can also do these two communications with its pins, so its totally on the programmer. I hope you all know about interrputs, if not then you should have a look at Interrupts in PIC Microcontroller. PIC16F877a has total 8 interrupt sources in it. An interrupt source is some event which generates interrupt, this source could be a timer like interrupts are generate after every 1 sec, or it could also be pin state change event, like if pin state is changed then interrupt will be generated. Timer Interrupts ( Timer0 / Timer1). Thank you for sharing this material on pic 16f877a, I was looking for meterial so some time ago.I was a layman in programming but this tutorial helped me a lot. My name is thiago I’m in Brazil. Can we copy all data from an existing pic 16f877a? can you provide servomotor code for robotic arm with pwm using pic 16f877a? we are going to use 4 motor and port c.